Today during its Build conference, Microsoft has finally announced what it’s going to call its new Web browser for Windows 10. 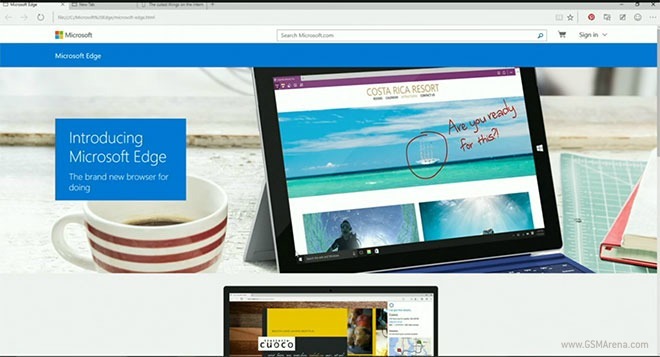 This has been known so far as Project Spartan, but its official name will be Microsoft Edge. Edge will be the default browser in Windows 10, although a version of Internet Explorer will also be in there just for compatibility’s sake. Microsoft Edge will work with Cortana in Windows 10, so for example you’ll be able to say stuff like “Hey Cortana, open gsmarena.com”, and that will happen for you in Edge. The New Tab page has been redesigned and it uses Cortana too, showing you favorites, a search bar, featured apps, news stories relevant to you, weather info, stocks, and sports. Extensions built for Google Chrome will be able to work in Edge with very minor modifications, it turns out. The same should be true for Firefox extensions too. And as previously unveiled, Edge will come with built-in note-taking and sharing features, which allow you to annotate any Web page and send the result to friends or coworkers. The browser will also sport a reading mode with a built-in reading list.